Taking kids on holiday is an exciting experience as it creates a wonderful and loving atmosphere among the family members. One of the most popular and common vacation activities with kids includes taking them to a wonderful beach and allowing them to play on the beach with water, sand and the view. Here we list out some of the best baby beach tents on Amazon that can be purchased online. These beach tents for babies selected after reviewing each tent’s quality, price, features and feedback from customers. You can check our earlier review of adults camping tents and some off-road bikes. The Lil Nursery Tent by Pacific Play is surely one of the best baby beach tents available online. Its cute and colorful look makes it very likable to kids. The design and structure of the tent ensure that your baby will be completely protected from UV sunlight. The roof of the tent is made with strong and solid enough UV treated SPF 30. The mesh panels at both sides of the tent ensure proper ventilation inside the tent. The tent is virtually weightless as it weighs just 2Ibs. If you are looking for a basic, strong, portable and affordable baby beach tent, the Pacific Play Tents Lil Nursery Tent is a good choice. 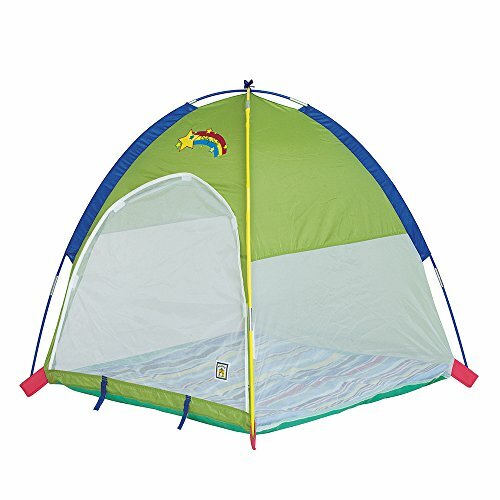 This one is little costlier for a baby beach tent but you can expect to have a limitless number of wonderful features that make your kid much more protected and happy while they play on a beach. 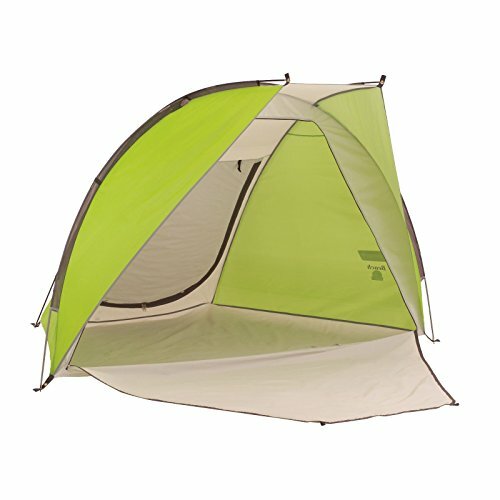 The self-expendable design of this tent is particularly unique as it pops up in just a second and folds down in just three seconds. So, it’s completely hassle-free to use. You can be ensured that your baby will be completely protected from UV sunlight under this tent as it is made out of durable T190 UV protected Nylon with a rating of 50 plus UPF. 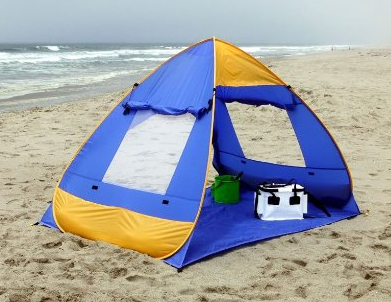 This is one of the simple and best pop-up tents for beach use by kids. Weighing just over 6 pounds, it is very easy to carry from one place to another. So, its strong make, use of high-quality UV protected Nylon and unlimited other features make it one of the best baby beach tents available on Amazon. If you do not have any budget constraints, we suggest you go for this one. This one has one of the most fashionable designs for a baby beach tent. Actually, this one is not designed especially for just the babies. But its strong built, structure and design all make it simply a perfect baby beach tent. In fact, this small tent is good enough to provide protection for an entire small family from the UV sunlight. 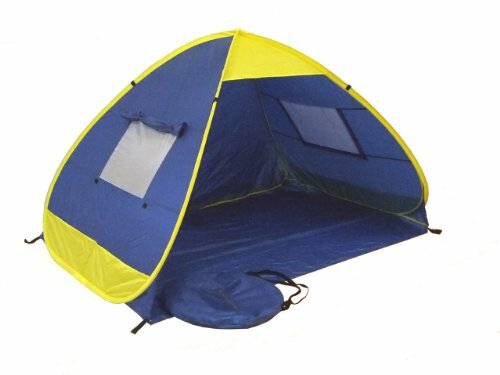 The number of positive reviews on Amazon of this small tent tells the level of satisfaction the customers had buying this tent. With a center height of 57 inches and a large 7.5 ft. x 4.5 ft. footprint, this tent is a perfect match for a small family on a beach holiday. You can expect to have enough privacy and also proper ventilation with 2 zippered doors, one on each side of the tent. There are 4 hanging pockets inside the tent to allow you and your kid store whatever thing you want to store. 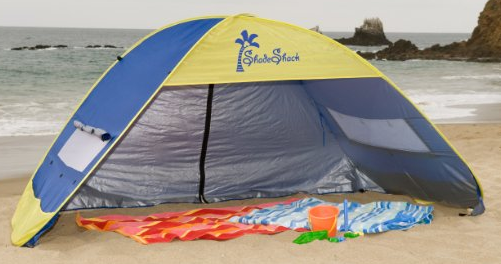 Shade Shack Instant Pop Up Family Beach Tent is perhaps the easiest beach tent to use as it provides a one piece pop up design that will easily set up itself and you don’t have to do any kind of assembly. The tent is not intended just for the babies that mean the entire family can take shelter and get complete protection from UV sunlight. As it is made for the entire family, it is much bigger (Large size of 90 inches x 53 inches x 51 inches) than the most other baby beach tents. So, there are plenty of room inside the tent to allow you and your kids to sleep, play and store beach accessories and toys. The use of zinc-coated 190T Polyester as the tent fabrics provide 30 plus UPF protection and also blocks 96 percent of harmful UV rays. The weight of the tent which is 4.6 pounds makes it very easy to carry as well. 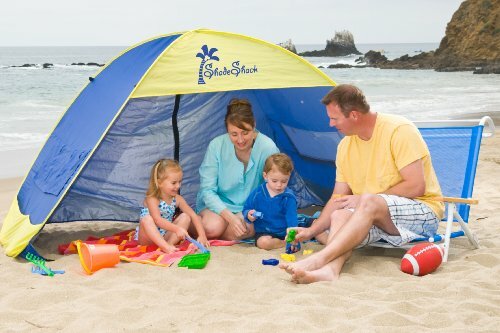 When talking about some of the top baby beach tents, the Schylling Play Shade is one that you must include because of its likable color, strong built and amazing design. Made using waterproof polyester, this small tent offers highest UPF ranking available at 50+ and it pops up and down in just seconds. So, you can be completely sure that your kids will be completely protected from UV sunlight when they play on a beach. With dimensions of 2 x 15.8 x 15.8 inches and 2.9 pounds of weight, there are plenty of rooms for your kid to sleep and play inside the tent. It is perfect for both indoor and outdoor use. 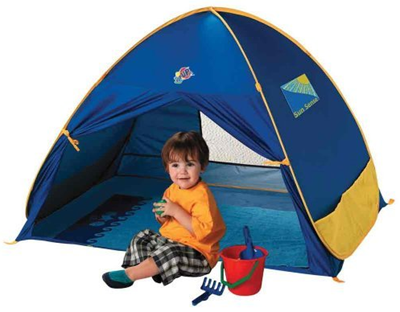 These baby beach tents are taken based on high customer reviews on Amazon. That means you should take a look at each of the above-mentioned tents before selecting the one you buy. If you opt to buy one which is not on this list, make sure you choose one with kid likable color, easy pop-up and pop down design, lightweight and perfect UV sunlight protection. Buy one high quality, colorful yet affordable baby beach tent and make your kids happy and protect them from harmful UV sunlight.